The holiday season is in full swing and I’m preparing for my trip to California where the women in my family come together to make hundreds of tamales for Christmas. It’s one of my favorite family traditions and I can hardly wait to catch up with all of the ladies as we spread, fill, and pack our delectable treats. A couple of years ago I wrote a blog post about our entire tamal-making operation, the traditions we’ve maintained throughout the years, and the new ones that we have incorporated. Today I’d like to share more about the newer traditions, some of which include introducing a signature cocktail to the mix, and the spirit of giving back – the latter being the most popular among our tamaleras. Below is a copy of the invitation text that we sent for this year’s gathering along with some commentary explaining each section. Since this is a full-scale production, we thought it was important to set expectations for our guests. Sometimes we have newbies who’ve never been to a tamalada and it’s important that they understand what this affair entails. Feel free to incorporate some of our traditions into your tamalada and make it your own. It’s that time of year again – time to get busy making our Christmas tamales! This year we’ll be sipping on hibiscus sangrias and enjoying homemade pozole as we catch up on family chisme. We’ll also be steaming a pot of tamales to taste, and then freezing the rest for Christmas Day. A few things to note: this year, we thought it was important to include that there’d be food to enjoy as we work. There have been years where we don’t eat until late, when we steam the first pot of tamales, which is usually well into the night when we are already starving. Luckily this year I convinced my mom to make a big pot of pozole to enjoy throughout the day. Also, 90% of the tamales we make are frozen and then enjoyed on Christmas Day. Nobody takes tamales home. We’ve had a few people ask if they can pay and take some home, but that’s not what our tamaladas are about – we make them together, with the people we’ll be celebrating and eating with on Christmas Day, with the exception of a few family friends who enjoy helping out just for kicks. Each year we’ve introduced a new tradition, whether it be a Bloody Mary bar or a unique signature cocktail, and this year we’ll have a tamalada photo booth so be sure to bring your favorite apron! I’m very excited about this one! Each year the younger generation likes to introduce a new tradition – usually it entails creating a new signature cocktail for all to enjoy. The first year we started with mimosas, then a potluck Bloody Mary Bar, last year we sipped on a festive tequila concotion, and this year I’ve taken the lead on making a delightful hibiscus sangria. I’m also very excited about our photo booth. We’re going all out – we got a backdrop printed, which will be framed with large paper flowers, and my creative cousins are already working on the photo booth props. We’ll also have activities to keep the kids occupied, which will be led by my sister who’s a teacher and my younger cousin who’s great with the little ones. There will be tamal-inspired coloring contests and story time, featuring the books Too Many Tamales and T’was Nochebuena. As you can see, this is a true family affair that gets everyone involved. Our toy drive is always a fan favorite and we want to continue with the philanthropic element of our tamalada so we are asking that you bring a new toy, pajamas, or book for the Junior Foundation Charities (www.juniorfoundation.org), which supports families with children who are battling cancer. The children range from ages 2 to 18 years old. This is by far my favorite aspect of our tamalada. My mother introduced it several years ago and each year people tell us how much they love the spirit of giving back that we’ve incorporated into our event. The first year we filled an entire truck with toys, books, and pajamas and our donations have continued to grow and grow. We’ve even had people stop by simply to drop off toys. So if there’s an organization that touches your heart, please consider raising awareness about it during your tamalada. With the holiday spending frenzy, I’ve found that people are less inclined to write a check for organizations, but they’re definitely willing to pick up an extra toy or book for a child in need. P.S. We’ll be providing the drinks and pozole, but feel free to bring your favorite finger food or some sweet treats to enjoy as we work. Leave a comment and let us know if you’ll be bringing a lil’ something. My mom was adamantly opposed to me including this last part on our invitation, because she doesn’t want guests who will be working all day to feel obligated to bring something, but my cousin Candice and I shot her down. Yes, everyone will be working, but it’s more of a social gathering – a party of sorts – and we’ll be there all day, so we want something to snack on if we get the munchies. Chocolate, fruit – anything will do! Definitely encourage your guests to bring a little something – especially if you’re providing the main meal, libations, and entertainment! Hope this helps with planning your next tamalada. If you have any questions, feel free to leave a comment and be sure to share pictures and tag me on Facebook and Instagram! 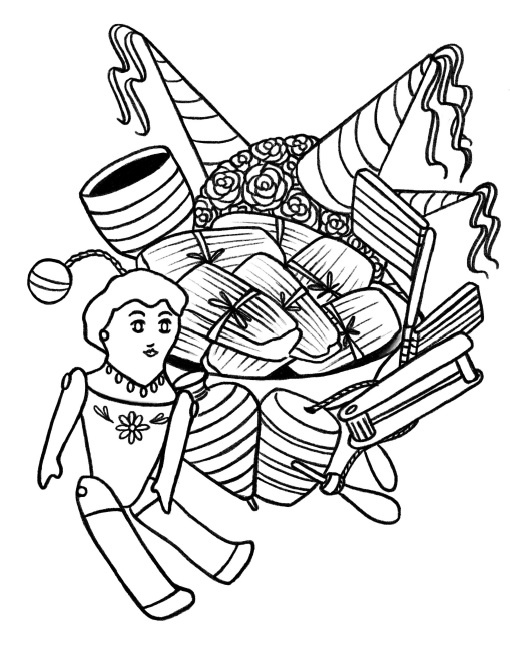 CLICK HERE to download a free copy of my Tamales, Traditions, & Toys custom illustration by Miel Colores to print and color.